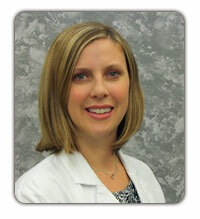 Kristy Donaldson is a certified Physician Assistant. She began working at Atlanta Breast Care in the spring of 2013. She was drawn to the practice based on the amazing care they provided a best friend who overcame breast cancer. She came to us after working in the Emergency Department at Dekalb Medical Center for 5 years. She graduated from PA school at Emory University with a Masters of Medical Science in 2007. Kristy was a paramedic in Barrow County, Georgia for 6 years prior to starting PA school and received her Bachelors of Science in Education from the University of Georgia in 1999. Kristy currently lives in Midtown Atlanta with her husband, Andy, and 2 young children, Paige and Tyler. Her free time is spent seeing and experiencing Atlanta thru the eyes of her children. She is an expert about the Zoo, Atlanta Botanical Gardens, Children's Museum, Aquarium, multiple jump house locations, piedmont park, Tinker Bell and Curious George. If she gets the chance, she likes to go for a run or play tennis and loves trying new restaurants in Atlanta.